This book shares the insights of seven industry experts with regard to managing people remotely. In the first chapter, Darel Cullens article,How to Motivate Your Team, applies Maslows pyramid of needs to offshore teams. In the second chapter, How to Create a Self-Supporting Team,NicoKrijnen shares his experiences with building a remote team from scratch in the Ukraine. In chapter three, Hugo Messer take you through the differences between managing a local team versus a remote team. Oscar Halfhide explains how relationships are the cornerstone of outsourced work. 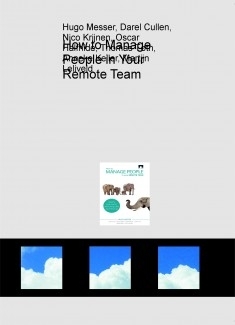 In his chapter, Making Distributed Teams Work: Trust, Imitation, and Control,Thomas Tøth shows us how important it is to build emotional connections in real life between the team members. Anneke Kellers chapter, Outsourcing and Different Generations, looks at people from a different perspective to demonstrate how generational differences influence offshore collaboration. In the last chapter, Getting Into India, MartijnLeliveld shares his experiences with building a team in India from the ground up.